Cat Doll is a cat plushie persona of someone who's real life name just happens to be Cat though unfortunately their surname is not Doll in real life. That would have been awesome. They have neglected to reveal their surname online though Mon knows them in real life and is also keeping their surname a secret. 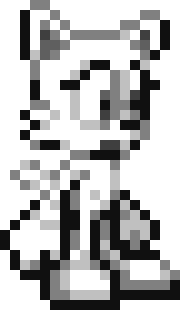 The character is a drone or pet created using pieces of Mon's body and mostly appears in Mon's canon. Though lacking any major skills or abilities and being rather physically weak on their own, it's their ability to work together in mass that makes them a rather formidable foe. Though each is a separate identity with its own memories but same personality, their memories become shared when they rejoin Mon, though don't share memories with Mon herself. Happy to exist though having no qualms with rejoining Mon and essentially being destroyed until they are needed again they have an oddly happy and obedient persona. However one doll often stays outside of Mon whilst the others don't exist but when the dolls are used 'swaps' places with a new one via all of them rejoining Mon and a new one separating. They also do this on a regular basis. This allows all the dolls to experience the world around when they are not yet needed. Although being multiplied hundreds of times and having different experiences, her personality always remains unchanged and identical to her siblings. Cheerful and fun loving, Doll does everything with great enthusiasm and energy. A hard worker and great team player they are loyal to their siblings but may put the dolls' interests above other people, except for her master Mon who she loves with all her heart. Prone to bouts of anger or tears they are quite emotionally unstable though they are always there for each other. Lacking any real depth to their emotions and the inability to concentrate mentally or be serious, the fact they are indeed a drone and not a real person can shine through sometimes. Child-like and cute in nature though often spoiled and childish they can be lovable or annoying making them an acquired taste. likes fun things (yes, that too), working together with her siblings, water and Mon, dislikes getting torn, getting burnt and getting dirty. Little is known about the real life Catrhea as she rarely talks about herself other than her avatar's canon. The character of Catrhea is spawned in massive numbers from pieces of Mon and is some sort of drone, slave or pet. It's not certain where Mon's Dolls come from but they could be her imagination of her best friend's personality from when Mia Felinus was in her tribe before becoming Diit Mon. lives with her mother and sister in real life. I believe their father still lives with them but they are hardly ever mentioned. In Mon's works they are pets that Mon creates using pieces of herself and she can have huge numbers of them at a time, often hundreds. They are like siblings to each other and see Mon as their mother. exists within a normal setting, often urban. Rarely appears in their own works but is a constant feature in Mon's works. less than a foot tall. white plush toy cat with black eyes and black inside the ears and mouth. none. they are a plush toy so they have nothing to hide. technically is she an accessory? she rarely carries anything. sometimes a knife.